I have been looking forward to reading The Fire Wish for some time. There are so very few stories written about jinni's. I, myself, have only read one. I was really curious about the storybook world and how the jinni's would be worked into the historical setting. It turned out to be fabulous! I could picture the jinni's home as well as the land above them. I could picture the people and connected with these characters. Najwa and Zayele. Faisal and Kamal. They are all from different worlds, but become entangled together in this story. Najwa and Faisal are jinni's training to help their people and army in different ways. They leave deep in the earth in a massive cave. Zayele is a girl who is promised to Prince Kamal in marriage. They live on the earth's surface as humans. The jinni's and humans are at war after two of their people, a married couple, were murdered years previously. They used to be at peace with one another and were progressing as a society up to that point. It was interesting to go along with Najwa as she gets her first glimpses of earth and as she learns more about humans. I also loved the jinni's cave and how the author made living in a cave like that work. I liked the POV and how the story unfolds. I figured out quite a few things early on and wished that things would have been hidden a little more, but it was still enjoyable reading along as the characters' figure things out. I really liked the friendship that Najwa and Prince Kamal have and how their relationship develops. Zayele and Faisal was a different type of relationship from the beginning and I would have liked to have them ease into things more. These would be my only issues with the story. 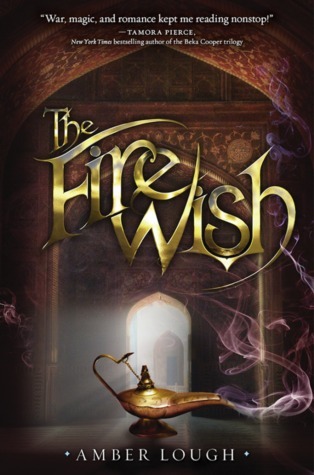 The Fire Wish was imaginative, sweet, but full of intensity in parts and action. The romance didn't overwhelm the story and the characters kept me reading on. I'd definitely recommend this to YA readers and those who enjoy a good historical urban fantasy. I'll definitely be grabbing the next book in this series! Source: Purchased and from NetGalley, which did not affect my review in any way. Not sure what a jinni actually is - will have to look that up. I sort of assumed it was a genie? But maybe not. In any case, glad you enjoyed this! I am so glad this worked for you. It is sitting in my tbr pile and you have me excited. I'm curious to see what happens in the next book. I think things are going to pick up in some ways - action wise. I hope you enjoy it! Sounds so good! Great review Tressa! I'm glad you liked this book! I've debated on getting it, but it sounds really interesting. I usually like the same books you do, so I'll have to see if my library has it. I don't think my tbr pile will ever not be growing. Lol! Another blogger reminded me that one of the protagonists could be a little annoying. I'm hoping for more character development in the next book. I really did like the setting and how jinni's were portrayed. I'm looking for more development in the second book.